We recommend checking out our discussion threads on the 3DR X8 Octocopter (RTF, 915 MHz) 3DR0252, which address similar problems with connecting and setting up Aerial Imaging Platforms & Drones 3DR. The user manual for the 3DR X8 Octocopter (RTF, 915 MHz) 3DR0252 provides necessary instructions for the proper use of the product Camcorders - Aerial Imaging & Drones - Aerial Imaging Platforms & Drones. Use the X8+ Octocopter from 3D Robotics to capture aerial video from a compact camera such as a GoPro (available separately). This version of the octocopter comes in a ready-to-fly (RTF) bundle, meaning a transmitter (radio controller), flight battery, and battery charger are all included and that no major assembly is required. 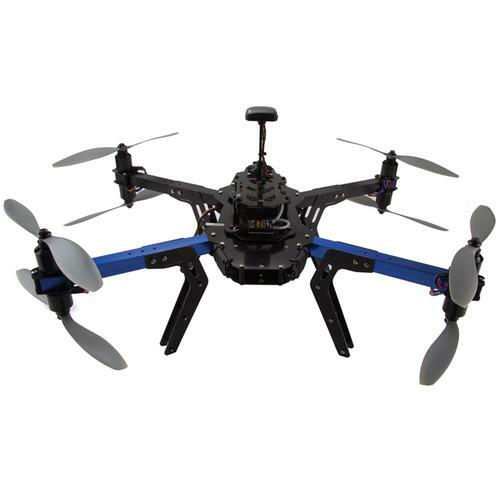 With a 1.7 pound payload, the X8+ provides up to 15 minutes flying time. To provide the autonomy the complexity of a multi-rotor requires, the X8+ features 3D Robotic's Pixhawk flight control system. This programmable system uses GPS and other data to provide varying degrees of autopilot redundancy, from full autopilot using the Ground Station to near manual. The Ground Station 915 MHz telemetry link is included so that you can update auto pilot courses in-flight, and view flight stats from a computer or Android mobile device. A USB cable and and Android OTG (On the Go) cable are included for connecting the ground-end module. Note: This version of the X8+ features a 915 MHz telemetry radio for use in the U.S. Aircraft used in Europe will require the 433 MHz radio instead. Users from other regions should consult local regulations to ensure compliance before purchasing. If you own a 3DR aerial imaging platforms & drones and have a user manual in electronic form, you can upload it to this website using the link on the right side of the screen. Box Dimensions (LxWxH) 25.0 x 24.0 x 8.2"
The user manual for the 3DR X8 Octocopter (RTF, 915 MHz) 3DR0252 can be downloaded in .pdf format if it did not come with your new aerial imaging platforms & drones, although the seller is required to supply one. It is also quite common that customers throw out the user manual with the box, or put the CD away somewhere and then can’t find it. That’s why we and other 3DR users keep a unique electronic library for 3DR aerial imaging platforms & droness, where you can use our link to download the user manual for the 3DR X8 Octocopter (RTF, 915 MHz) 3DR0252. The user manual lists all of the functions of the 3DR X8 Octocopter (RTF, 915 MHz) 3DR0252, all the basic and advanced features and tells you how to use the aerial imaging platforms & drones. The manual also provides troubleshooting for common problems. Even greater detail is provided by the service manual, which is not typically shipped with the product, but which can often be downloaded from 3DR service. If you want to help expand our database, you can upload a link to this website to download a user manual or service manual, ideally in .pdf format. These pages are created by you – users of the 3DR X8 Octocopter (RTF, 915 MHz) 3DR0252. User manuals are also available on the 3DR website under Camcorders - Aerial Imaging & Drones - Aerial Imaging Platforms & Drones.